The Pats won in a fashion that most likely had Bill Belichick VERY HAPPY well past the four-hour threshold. There’s your analysis. Last night scrolling through Twitter, adrenaline still pumping through my brain, someone tweeted a picture of a truck with a Sox logo on it. “Truck Day,” it said. What a stupid thing, I thought. Just keep shoveling more cash into the Fenway Group’s pocket. But through my cynicism, a tiny gleam of adolescent hope shone through. I scrolled back and liked the tweet. Why should I fall into that pessimistic trap that every jaded Boston sportswriter falls into? Who cares if it’s just a marketing ploy by Larry L. to get Auntie Sue from Vermont to buy another Brock Holt jersey tee? The words “Truck Day” genuinely got me excited. Spring is coming. But it’s not just the words “truck day” and “pitchers and catchers” that has me excited. The day after the Super Bowl officially begins countdown season for us striper-obsessed folks in the Northeast. Today is the day when Spring is no longer some amorphous distant picture in our minds. Today is when Spring starts to feel tangible–something we can reach out and just barely touch. In February, all of the holidays have long ago passed us by. We have no more Saturday and Sunday football games to keep our minds busy. All that stands between us and a tight line or shakedown cruise is a few weeks of freezing temps. Around the same time the Sox round into form in Ft. Myers, we’ll be fishing for trout. Get your fly and spin gear ready. Get those trout spoons and woolly buggers and midge flies organized. The trout trucks will soon be rolling down to your favorite kettle pond. Stocking generally starts the first full week of March in the Southeast portion of the state. Over the course of the month, the state will stock bows, browns, brooks and tigers. Spend a few warm early spring days down at the pond and you’re bound to catch a trout. It sure makes waiting for the stripers a little easier. Hey, have I mentioned that you can come hang out with Team Seven Stripes at BOTH of these expos? It’s going to be a fun time. Buy some gear, chat with some fishing legends, hear a seminar. At the Seven Stripes Booth we’ll be giving away plugs, Seven Stripes Merchandise, and maybe even a charter. Why would you miss this? Check out the podcast with the MSBA guys to hear about seminar speakers and vendors. Like a caterpillar shedding its cocoon, in 50 days, the Mal de Mer will emerge from under the shrinkwrap. We’ve got lots of updates planned for her this spring. Just wait until you see them (16” sonar/radar screen anyone?). Here’s hoping we don’t get any late March blizzards again. The best cruise of the year. That first splash of the boat can make it feel like you never left the bay. Winter and all of it’s dark and cold memories are in the distant past. The Bay is eerily quiet but it won’t be for long. And just like that, they’re back. 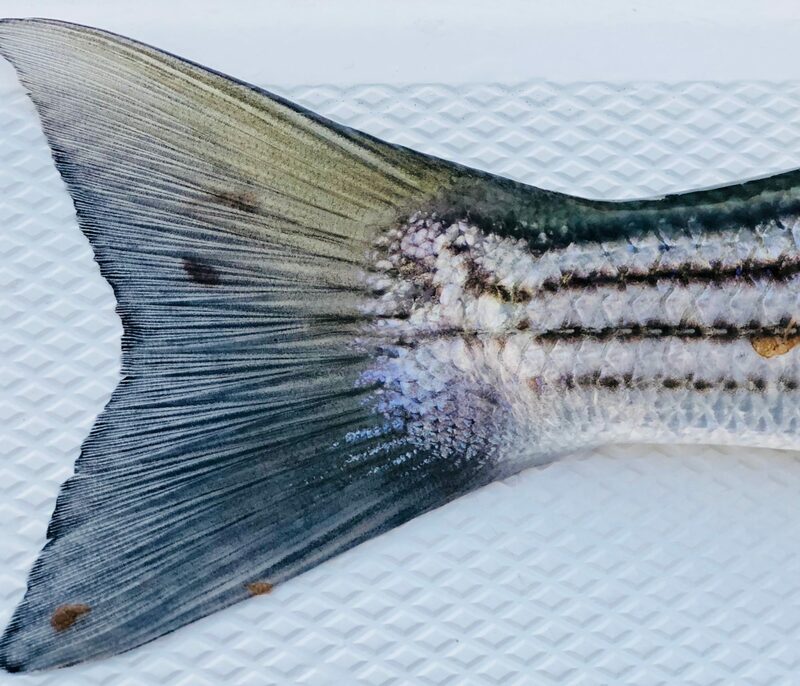 So what if your first striper of 2019 is the same size as the trout you’ve been catching for the past month. The striped bass are back and growing in numbers with each warm day. So, reader. Do not go gentle into that good night. There are exciting happenings on the horizon.